Does Academic Freedom Apply to Both Secular Humanists and Christians? A prominent concern among educators in our schools, colleges, and universities is academic freedom. Academic freedom is the ability of the instructor to teach what he/she feels is the truth about reality in an intellectually honest and reasonable way. 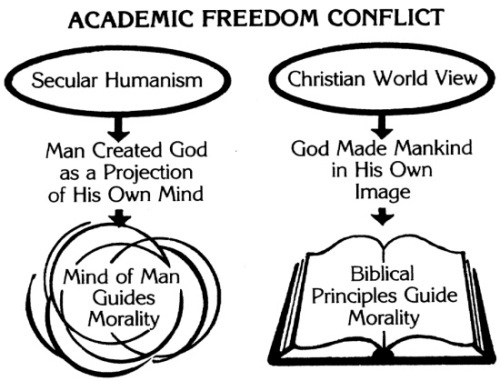 However, a conflict over academic freedom has emerged between proponents of secular humanism and those who accept the Christian world view. The Christian view is based on belief that God made mankind in His image, and that He communicates to us through the Scripture’s principles, concepts, and data that we need to build a proper understanding of ourselves, others, and our world. Secular humanism is based on belief that man created God as a projection of his own mind, and that the mind of man is the final arbiter of morality and the only source of information about ourselves, others, and our world. In the schools, secular humanists are allowed to spend a great deal of time presenting their position to students. Yet Christians are discouraged from presenting their position because it is claimed they are teaching religion. Many educators assume it is illegal to teach religion, for doing so is seen as a violation of separation of church and state. In this controversy, the position of the secular humanists is often labeled non-religious and the Christian position religious. Then the humanists argue that because their position is labeled non-religious or secular, it can be taught, and the other side, because it is labeled religious, cannot be taught! During the Cambrian Period there suddenly appeared representatives of nearly all the major groups of animals now recognized. It was as if a giant curtain had been lifted to reveal a world teeming with life in fantastic diversity. The Cambrian "curtain" has become the touchstone of the creation theory. Darwin was aware of the problem this created for evolutionists, and it remains a problem today. Evolutionists keep hoping that new discoveries will eventually fill in the missing pieces of the fossil puzzle, but the chance of success may be less than those of finding the proverbial "needle in the haystack." There are dozens of books highly critical of evolutionary theory written either by evolutionists or by individuals who at least do not agree with the creationist position. Rarely does this material find its way into college or high school textbooks or libraries. The result is that few students are aware of the many difficulties in evolutionary theory. I personally hold the evolutionary position, but yet lament the fact that the majority of our Ph.D. graduates are frightfully ignorant of many of the serious problems of the evolution theory. These problems will not be solved unless we bring them to the attention of students. Most students assume evolution is proved, the missing link is found, and all we have left is a few rough edges to smooth out. Actually, quite the contrary is true; and many recent discoveries ... have forced us to reevaluate our basic assumptions. Students are often grossly ignorant of this research, partly because it does not support the belief structure of humanism. To some degree, the schools serve as apologists for humanism, and therefore also for evolution. They avoid discussing the problems of evolution, possibly because of a fear that the theory will lose credibility if the problems are pointed out. But to strengthen the theory, if that is a worthy goal, the whole theory and each of its many assumptions must be critically examined. In addition, presenting the creationist arguments will help students to understand more objectively what evolutionary theory purports to explain. A good education requires that science students at least be aware of the basic theories opposing modern evolution theory. The writer has yet to see an objective presentation of the creationist ideas in any standard biology textbook, although, as noted above, a few of the more current books now devote a few pages to creation theory. "A good education requires that science students at least be aware of the basic theories opposing modern evolution theory. " The tendency for humanists and the liberal press to label ideas which are unpopular as religion and thus off limits to teachers is both incorrect and pernicious. Virtually any belief can be labeled religious, and virtually anything can be labeled non-religious. It is generally thought appropriate for schools to teach "thou shalt not steal, lie, or murder" but inappropriate for them to teach "thou shalt not commit adultery or take the name of God in vain." Somehow the first three prohibitions are not religious, but the last two are. Yet all five are part of the most basic religious law known to the Western world, the Mosaic law covenant. Many concepts commonly taught in the schools clearly have a religious origin. Included would be the goal of treating others as one would like to be treated, the need to take an occasional break from one's work, to be balanced in all things, and the attempt to be fair to all people. One of the most ambitious causes of the liberals in recent years has been insuring equal rights among all people. Yet this idea was espoused as a religious goal in the writings of the Christian Scriptures over 2,000 years ago. Before the current equal rights trend, this idea would probably have been considered religious; thus, it could not have been taught in the schools. Now that the liberals have espoused this cause, it is no longer seen as a religious idea but a secular idea. Thus, we can now teach the Christian concept of racial equality. Incidentally, the source of the belief in the equality of man is the Bible, few ancient books espouse this concept, and it is foreign to most non-Christian peoples. Consider other topics. Rarely do students hear an objective and effective presentation of the case against abortion, homosexuality or fornication. Again, one side of these issues tends to be labeled non-religious and therefore a topic teachers are permitted to discuss, but the other side tends to be labeled religious, and off limits in the school. The facts are that, for whatever reason, teachers often indoctrinate their students in one side, and many times it is the secular humanist position. "The very fact that we usually do not mention religion or religious issues means that we are teaching very definite ideas about religion … "
What about teaching religion? The very fact that we usually do not mention religion or religious issues means that we are teaching very definite ideas about religion, especially that religion is not important. A prolonged, conspicuous absence of an idea tends to produce fairly definite attitudes about the idea in most children, and for this reason it is impossible for the schools not to teach something about religion. For those concerned about the practicality of this issue, it is clear that religious issues can be objectively studied and discussed in the classroom. In Australia, for example, where only 3% of the population attends church regularly, classes in religious education are included as an integral part of the school curriculum at all grade levels. An excellent summation of this issue is presented by John Whitehead in The Separation Illusion (Mott Media, P.O. 236, Milford, Michigan 48042). This book discusses the implication of the fact that religion is going to be taught in the schools in one form or another. It is only a matter of what religion is going to be taught, and how it is going to be taught. Once we accept this reality, we can begin to deal with this important area in a manner acceptable to the total community. "Anything that affects our belief structure is going to affect us religiously." Viewing the concept of religion broadly, it is impossible to take religion out of the schools because religion or its lack, is an integral part of our life and is going to affect our total belief structure and outlook on life. Anything that affects our belief structure is going to affect us religiously. Religion is a belief structure, and all fields of knowledge are based upon belief structures, even though some fields of knowledge include more empirical content than others. To say that the schools can teach the entire world of knowledge but must exclude religion is censorship of the worst sort. One is not truly free to teach unless one is free to bring all areas of knowledge to bear on a subject. There is no academic freedom where every area of knowledge can be taught except one, especially when that one area pervades, to some extent, all other areas of knowledge. Parents are rightfully concerned that teachers may attempt to indoctrinate students with a specific religious belief. This is a special concern if the student's religious beliefs happen to be different from the teacher's. While teachers may have some influence on the life of certain students, it must be remembered that students are intelligent, reasoning, thinking persons, and do not gullibly accept all that a teacher may say. Indeed, the experience of many teachers is such that it is quite difficult to help students accept even well-accepted axioms of science. The writer has had difficulty helping students understand the validity of such basic concepts as the influence of our environment on behavior and the importance of understanding other cultures in order to reduce ethnocentrism. If a child has strongly ingrained prejudices against certain groups, most teachers find it very difficult to overcome these prejudices. Likewise, if a student holds certain religious beliefs, it is not likely that one teacher is going to be able to change those beliefs. Even if the student is clearly right, confrontation with a teacher may encourage the student to search further into his own beliefs to insure that they are valid. If schools are to be a place where students can debate important questions, it would seem that eliminating religious questions would shelter students from an important area of debate which is crucial for living a well-rounded life. It has been said that the only things important in life are religion and politics. Although this is no doubt an exaggeration of the truth, it seems desirable to spend a great deal more time on these areas, and not less. Many Christians have noted that those who view homosexuality as an acceptable lifestyle openly teach their position in the school (see "The Gay Movement and the Rights of Children" in the Journal of Social Issues, V. 34, No. 2, 1978, pp. 137-148). Yet Christians, afraid of being labeled "ultra-rightist," "fanatical," or "uninformed," often stand back and say nothing. This is tragic, for the Christian faith requires that Christians speak up intelligently and cogently in presenting the Christian standpoint on these important issues. Christians must support each other and their right to convey their beliefs. Because all too often Christians do not present their position, students are totally unaware of the "other side" on many social issues facing us today. The situation is such that Christians must no longer be afraid to speak out for their position. If they are right, and have thoroughly studied the issue, they have an obligation to present their case. This does not mean that one argues for a position only because it is a part of his/her tradition, but that one reasons out a firm Christian stand, and responds according to what he/she feels is right. If Christians did openly speak out in defense of their beliefs, it is likely that there would be repercussions in many schools, including denial of tenure (as has already happened in a number of cases) and outright firings. The case of a Christian teacher who lost his job in a private religious school because he taught creationism in his science classes received much publicity recently. There have been many similar cases throughout the country, although, interestingly, most of these have been in religious schools. The plight of Christian teachers should merit the attention of a Christian organization such as the Christian Legal Society. A group of attorneys familiar with the law should be able to help their brothers fight for academic freedom. Furthermore, legal publications could inform Christians of their rights and the legal recourses available in case they are threatened with loss of their jobs or are denied the freedom to express a Christian viewpoint. Of course, it is necessary to act tactfully and respectfully, showing awareness that differing positions generally each have some merit. The efforts in many schools to silence one side totally are clearly inappropriate and demand an intelligent, but kind and calm, response. I am totally at a loss as to how you arrived at your conclusions in your article on "How School Principals Feel About Homosexuality" (June 1978 issue). You state that 7% of the principals reported complaints of homosexual contact between teachers and students compared to 13% complaining of heterosexual contact. This is a ratio of 35 complaints about homosexuality out of every 100 complaints. In view of the fact that according to the best estimates, 5% of the population are exclusively homosexuals, your data would indicate that homosexuals are 7 times more likely to seduce students than heterosexuals. Yet you conclude that "homosexual teachers are less likely to molest students than heterosexual teachers." In spite of the fact that I have a Ph.D. in research and statistics, I am unable to understand your conclusions. Further, I realize that many writers are anxious to serve as apologists for homosexuality and, possibly as a result of these efforts, I have noticed a number of gross statistical and thinking fallacies in their reasoning. Please respond to the above comments. Over one year later, McCall's has not replied to my letter. Hopefully, they will at least be aware of this problem and, perhaps, less likely to make this error in the future. While it is difficult for Christians to respond to a large number of articles, we could intelligently respond to blatant errors, or at least ill-founded attacks against Christianity. If each Christian did so, there would probably be far less publicly accepted incorrect information. Although this would undoubtedly not solve the problem of fair treatment for differing views, it should help considerably. "… it is imperative that Christians be well informed, well read, and insistent on their rights." In particular, there is a clear legal freedom to teach the traditional Christian values, as at least one among other viewpoints. To take advantage of this freedom by voice or letter, it is imperative that Christians be well informed, well read, and insistent on their rights. There are excellent works put out by Christian book publishers written by reputable scholars on almost any area that would concern an educator. This awareness is necessary in order for a Christian to properly "make a defense for the faith that is within us." * Dr. Jerry Bergman is a member of the Department of Educational Foundations & Inquiry at Bowling Green State University in Ohio. His Ph.D. is from Wayne State University in Detroit, majoring in Educational Psychology and Evaluation and Research. He has authored several books and many articles in his field. This article was originally published January, 1980. "Does Academic Freedom Apply to Both Secular Humanists and Christians? ", Institute for Creation Research, http://www.icr.org/article/does-academic-freedom-apply-both-secular-humanists (accessed April 19, 2019).